People who spend a lot of time driving will need quality 6×8 speakers for their car audio system. 6×8 speakers have become very popular among car owners, because they offer durability and an incredible sensory experience while listening to music, podcasts or the radio. Many people focus on the digital display in a car audio system when they are considering an upgrade. But the speakers are what drive sound throughout the car. If there is one component to upgrade or replace, it is the speakers. The best 6×8 speakers will completely transform the way you listen to music in your car. But choosing a great set of 6×8 speakers is not easy. There are so many options out there, with new models coming out every year. If you are just learning about these speakers, you may feel a little overwhelmed. Our guide reviews the five best 6×8 speakers out there. We will assess the weight, dimensions, power handling and sensitivity, along with other important features. 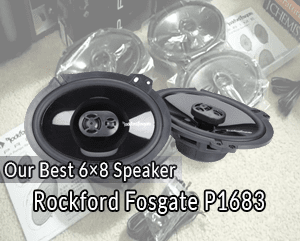 A full range, three-way 6×8 speaker, the newest version of the Rockford Fosgate P1683 speaker delivers incredible performance for the price. It features an innovative Vertical Attach Surround Technique, or VAST, technology. With this tech, the speakers effective radiating cone surface is increased, which produces better efficiency and output capabilities. The speaker is made with a polypropylene injection model cone, with a rubber surround and an Integrated Concealed Crossover network. Thanks to such impressive construction, the speakers sound incredible without any mounting boxes. The P1683 can handle peak power of up to 260 watts per pair, which means they will work excellently with an amplifier. Those who are not planning on adding an amp to their system will be pleased with the RMS power, which is at 60 watts per speaker. Another impressive feature in the speaker is how it comes with an OEM adapter plate system. It means that each speaker has “break away” tabs that can be removed, if the speaker needs to fit into smaller openings. More power means louder music, especially when combined with an amp. Sound quality is very clean and crisp. The Integrated Concealed Crossover network results in very easy installation. One of the most recognizable brands in the industry, Pioneer is responsible for some of the best car audio equipment in the world. The TS-A6886R speakers are no different. These four-way speakers offer excellent power, punchy bass and a very wide range. These 6×8 speakers have a frequency response range of 28Hz to 39kHz, with a sensitivity of 91dB. The crossover frequency is measured at 9700Hz. The result? Music that sounds incredible, no matter what the genre. 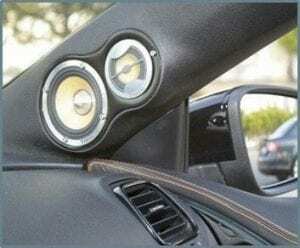 Those who listen to music at a modest volume while in the car will be happy with these speakers, even if they are the only upgrade to the default car stereo system. Those who desire extremely high volume levels without distortion will need to get an accompanying amplifier. These speakers are made with a lightweight, elastic polymer surround. The result is excellent cone movements and sound. It has two done tweeters with a midrange driver, which means that high frequency details in your music will shine through. Very high power capacity with good bass. Excellent dynamic range, which means all genres of music sound great. Very lightweight yet sturdy, which means they should last for years. Some users complain of the speakers requiring “break in” before they sound their best. The Cerwin Vega V468 is one of the most impressive 6×8 car speakers, if you are desiring a powerful auditory experience. Made with premium materials and a sleek design, these speakers are designed to impress. With a power handling capability of 400 watts, the Cerwin Vega V468 will deliver so much sound that you will not be able to hear any road noise when you are driving on a highway – even if your windows are DOWN! Remember that an amplifier will be needed to boost up that volume without distortion, as default car stereo systems cannot handle it. Another bonus with this speaker is the high sensitivity. It measures in at 94dB, which means that you will get an excellent sound experience on low powered systems too. The sound is clear, crisp, bright and very impressive in the midrange. Sound is clean and loud at all volumes and ranges. Only show their best form with an accompanying amp – or a whole new car stereo system. Round shape means they are hard to install in many cars. The Kenwood KFC-C6895PS three-way is a very solid car speaker option, especially for those who desire high RMS power. These speakers deliver a stellar listening experience, providing articulate lows, impressive highs and punchy vocals. Whether you listen to pop, rap, hip hop or rock, you will find the experience excellent. Enjoy blasting the music when you are on the highway or going on a long road trip? The high RMS on these speakers (85 watts) means that distortion will not be an issue. And thanks to the rubber surround, durability is not even in question. These speakers will be shining for years to come. If we had a wish, it was for more maximum power. It is rated at 360 watts of max power, which is slightly low considering the RMS power of 85. It is the only major knock on an otherwise great speaker. Very pleasant and clean sound, especially on the mids and highs. Bass is very good for a car speaker setup. Higher RMS power means distortion at higher volumes should not be an issue. The installation is not very easy, mostly due to the way the wiring terminals bend when they are being connected. When in the high frequency range, the tweeters get overwhelmed and that negatively influences the sound. The second Rockwood Fosgate speakers to make it onto our list, the R168X2 prime is an impressive option for those who are seeking budget car stereo speakers. This coaxial speaker is a sensational option for anyone who enjoys listening to drum and bass, because those are the areas where the speaker shines. The polypropylene cone, half-inch silk balanced tweeter and steel basket deliver excellent performance. Not only is the bass powerful and clean, but the general sound of the speakers is very crisp and precise. There is no muddiness, which can be a telltale sign of cheap car speakers. If you want two speakers that will last for close to a decade, provide impressive sound and bass, and deliver clean vocals, the R168X2 is a good choice. Made of high quality material that is designed to last. Excellent in the mid to high range frequencies. Great for listening to drum and bass. Those who love rock or hip-hop may find the bass a little lacking for those genres. When the volume is turned close to all the way up, the sound can be a little too sharp for some ears. Cars have become more luxurious, comfortable and energy efficient than at any point in human history. But the audio systems in most cars are still sub-par. You get a passable experience, if you listen to the odd pop song on the radio. But if you are someone who loves music and spends a lot of time driving every week, a quality car speaker system is a must. Your music will sound incredible, whether you are listening to rock, punk, hip hop, r&b or jazz tunes! Speaker sensitivity refers to how effectively a speaker is converting power into volume – or watts to decibels. With a higher sensitivity rating, car speakers are able to reach a louder volume without distortion or loss of sound quality. Since the average car stereo system is low-powered, speakers with a sensitivity rating of 85dB or higher are a must to achieve loud and high quality sound. The two figures that inform us about how much power a speaker can handle are the RMS and peak power. RMS power, or root mean squared power, refers to the amount of power a speaker can handle over time, without producing any distortion. Peak power is the maximum power that a speaker can handle without blowing. Since most car stereo systems are low powered, the peak power of a 6×8 speaker is not too important. Most people are never going to get anywhere near the peak power of their speaker. The only time you should care about peak power is if you installed external amplifiers to your car stereo system. Amps can help you get more power out of the system, which may push your 6×8 speakers to the max. But the figure that matters the most is RMS power, as it is going to tell you how much power the system can handle without distorting. 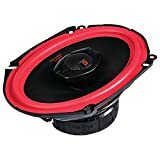 Ever been inside a friend’s car and noticed their speaker system is distorting a lot at higher volumes or base levels? It may not necessarily be due to a set of cheap speakers. The issue is that many car speakers degrade fairly quickly, as they are made with poor quality materials. When choosing 6×8 speakers, it is important to go for a model that has a durable woofer, tweet and surround material. Woofers are often made with synthetic films such as polypropylene or woven fabrics, along with a metal like aluminum or titanium. For the tweeter, soft materials are required. Poly, silk or other textile blends are preferred, as the quality of material greatly impacts the sound quality. There are speakers made with ceramics or metal tweeters. Those produce a much brighter and snappier sound on the highs, but may not be preferred by all listeners. And finally, the area surrounding the woofer should move freely and produce a very intense and bold bass. The speaker surround is usually made with cloth, foam or rubber, with rubber being the best option as it is able to withstand extreme temperature and humidity. Assuming that all 6×8 speakers will fit into every vehicle is a misconception. Every car has its own configuration. The space where speakers fit is distinct, depending on the make and model of the vehicle. What is the best way to know if a set of 6×8 speakers will fit in your vehicle? The easiest method is to take out the speakers that are in your car right now. Remove those speakers and take their measurements. They should have model information on them, which you can look up online for confirmation of the measurements. Now that you have the measurements, you will be sure to buy 6×8 speakers that will fit into your car, SUV or truck! Now you have a full breakdown of the top five 6×8 speakers on the market. Instead of needing to sift through 50 or 100 products, you only need to compare five! 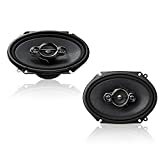 Those who are most concerned about the quality of sound that comes through their car speaker system, the newest version of the Rockford Fosgate P1683 speaker is the best option. It offers incredible value, durability and sound performance. The speakers will blow you away, especially when listening to music with heavy bass. If a more budget-friendly option is needed, the Kenwood KFC-C6895PS or Rockford R168X2 Prime offer an excellent alternative. They may not have the pristine and flawless performance of the P1683, but they are very respectable choices that will elevate your car music system. Do let us know what 6×8 speakers you ended up choosing! 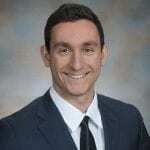 Share your experiences to help others! Thanks For this… I am looking to buy 6×8 speakers next week.